An ideal Fermi gas is a state of matter which is an ensemble of a large number of non-interacting fermions. Fermions are particles that obey Fermi–Dirac statistics, like electrons, protons, and neutrons, and, in general, particles with half-integer spin. These statistics determine the energy distribution of fermions in a Fermi gas in thermal equilibrium, and is characterized by their number density, temperature, and the set of available energy states. The model is named after the Italian physicist Enrico Fermi. This physical model can be accurately applied to many systems with a large number of fermions. Some key examples are the behaviour of charge carriers in a metal, nucleons in an atomic nucleus, neutrons in a neutron star, and electrons in a white dwarf. Illustration of the energy states: Energy-occupation diagram for a system with 7 energy levels, the energy Ei is degenerate Di times and has an occupancy given by Ni, with i=1,2,3,4,5,6,7. By the Pauli exclusion principle, up to Di fermions can occupy a level of energy Ei of the system. An ideal Fermi gas or free Fermi gas is a physical model assuming a collection of non-interacting fermions in a constant potential well. It is the quantum mechanical version of an ideal gas, for the case of fermionic particles. By the Pauli exclusion principle, no quantum state can be occupied by more than one fermion with an identical set of quantum numbers. Thus a non-interacting Fermi gas, unlike a Bose gas, concentrates a small number of particles per energy. Thus a Fermi gas is prohibited from condensing into a Bose–Einstein condensate, although weakly-interacting Fermi gases might. The total energy of the Fermi gas at absolute zero is larger than the sum of the single-particle ground states because the Pauli principle implies a sort of interaction or pressure that keeps fermions separated and moving. For this reason, the pressure of a Fermi gas is non-zero even at zero temperature, in contrast to that of a classical ideal gas. For example, this so-called degeneracy pressure stabilizes a neutron star (a Fermi gas of neutrons) or a white dwarf star (a Fermi gas of electrons) against the inward pull of gravity, which would ostensibly collapse the star into a black hole. Only when a star is sufficiently massive to overcome the degeneracy pressure can it collapse into a singularity. It is possible to define a Fermi temperature below which the gas can be considered degenerate (its pressure derives almost exclusively from the Pauli principle). This temperature depends on the mass of the fermions and the density of energy states. The main assumption of the free electron model to describe the delocalized electrons in a metal can be derived from the Fermi gas. Since interactions are neglected due to screening effect, the problem of treating the equilibrium properties and dynamics of an ideal Fermi gas reduces to the study of the behaviour of single independent particles. In these systems the Fermi temperature is generally many thousands of kelvins, so in human applications the electron gas can be considered degenerate. The maximum energy of the fermions at zero temperature is called the Fermi energy. The Fermi energy surface in reciprocal space is known as the Fermi surface. The nearly free electron model adapts the Fermi gas model to consider the crystal structure of metals and semiconductors. Where electrons in a crystal lattice are substituted by Bloch waves with a corresponding crystal momentum. As such, periodic systems are still relatively tractable and the model forms the starting point for more advanced theories that deal with interactions, e.g., using the perturbation theory. is the reduced Planck constant. and so forth. The reason that two particles can have the same energy is that a particle can have a spin of ½ (spin up) or a spin of −½ (spin down), leading to two states for each energy level. In the configuration for which the total energy is lowest (the ground state), all the energy levels up to n = N/2 are occupied and all the higher levels are empty. where N* is equal to (N − 1) when the number of particles N is odd, and its equal to (N) for an even number of particles. 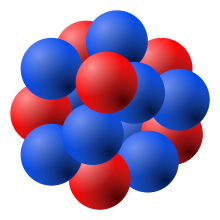 A model of the atomic nucleus showing it as a compact bundle of the two types of nucleons: protons (red) and neutrons (blue). As a first approximation, the nucleus can be treated as composed of non-interacting proton and neutron gases. The three-dimensional isotropic and non-relativistic case is known as the Fermi sphere.
. Now let's put N non-interacting fermions of spin ½ into this box. To calculate the Fermi energy, we look at the case where N is large. in the region of n-space where nx, ny, nz are positive. In the ground state this number equals the number of fermions in the system. The free fermions that occupy the lowest energy states form a sphere in reciprocal space. The surface of this sphere is the Fermi surface. is the Boltzmann constant. The Fermi temperature can be thought of as the temperature at which thermal effects are comparable to quantum effects associated with Fermi statistics. The Fermi temperature for a metal is a couple of orders of magnitude above room temperature. is the radius of the Fermi sphere and is called the Fermi wave vector. These quantities are not well-defined in cases where the Fermi surface is non-spherical. Here we discuss some important quantities that depend on the thermodynamics. For the most general treatment of the properties of a Fermi gas at finite temperature, skip to the respective section below. where this expression remains valid for temperatures much smaller than the Fermi temperature. This pressure is known as the degeneracy pressure. In this sense, systems composed of fermions are also referred as degenerate matter. Standard stars avoid collapse by balancing thermal pressure (plasma and radiation) against gravitational forces. At the end of the star lifetime, when thermal processes are weaker, some stars may become white dwarfs, which are only sustained against gravity by electron degeneracy pressure. Using the Fermi gas as a model, it is possible to calculate the Chandrasekhar limit, i.e. the maximum mass any star may acquire (without significant thermally generated pressure) before collapsing into a black hole or a neutron star. The latter, is a star mainly composed of neutrons, where the collapse is also avoided by neutron degeneracy pressure. For the case of metals, the electron degeneracy pressure contributes to the compressibility or bulk modulus of the material. where T is the temperature. Hence, the internal chemical potential, µ-E0, is approximately equal to the Fermi energy at temperatures that are much lower than the characteristic Fermi temperature TF. This characteristic temperature is on the order of 105 K for a metal, hence at room temperature (300 K), the Fermi energy and internal chemical potential are essentially equivalent.
. The grand canonical ensemble is recommended here as it avoids the use of combinatorics and factorials. also known as the Fermi–Dirac distribution. where the derivatives is taken at fixed volume and chemical potential. For the 3D case and zero temperature we retrieve all the results obtained above. The mathematical form of these expression is equivalent to the complete Fermi–Dirac integral. where me is the electron rest mass. This Fermi energy corresponds to a Fermi temperature of the order of 106 kelvins, much higher than the temperature of the sun surface. Any metal will boil before reaching this temperature under atmospheric pressure. Thus for any practical purpose a metal, can be considered as a Fermi gas at zero temperature as a first approximation (normal temperatures are small compared to TF). where A is the number of nucleons. Now since the Fermi energy only applies to fermions of the same type, one must divide this density in two. This is because the presence of neutrons does not affect the Fermi energy of the protons in the nucleus, and vice versa. where mp is the proton mass. The radius of the nucleus admits deviations around the value mentioned above, so a typical value for the Fermi energy is usually given as 38 MeV. Radius–mass relations for a model white dwarf, relativistic relation vs non-relativistic. The Chandrasekhar limit is indicated as MCh. In 1956, Lev Landau developed the Fermi liquid theory, where he treated the case of a Fermi liquid, i.e., a system with repulsive, not necessarily small, interactions between fermions. The theory shows that the thermodynamic properties of an ideal Fermi gas and a Fermi liquid do not differ that much. It can be shown that the Fermi liquid is equivalent to a Fermi gas composed of collective excitations or quasiparticles, each with a different effective mass and magnetic moment. ^ Fermi, E. (1926-11-01). "Zur Quantelung des idealen einatomigen Gases" (PDF). Zeitschrift für Physik (in German). 36 (11–12): 902–912. Bibcode:1926ZPhy...36..902F. doi:10.1007/BF01400221. ISSN 0044-3328. ^ Regal, C. A.; Greiner, M.; Jin, D. S. (2004-01-28). "Observation of Resonance Condensation of Fermionic Atom Pairs". Physical Review Letters. 92 (4): 040403. arXiv:cond-mat/0401554. Bibcode:2004PhRvL..92d0403R. doi:10.1103/PhysRevLett.92.040403. PMID 14995356. ^ Torre, Charles (2015-04-21). "PHYS 3700: Introduction to Quantum Statistical Thermodyamics" (PDF). Utah State University. Retrieved 2018-03-21. ^ Nave, Rod. "Fermi level and Fermi function". HyperPhysics. Retrieved 2018-03-21. ^ Ashcroft, Neil W.; Mermin, N. David (1976). Solid State Physics. Holt, Rinehart and Winston. ISBN 978-0-03-083993-1. ^ Kelly, James J. (1996). "Statistical Mechanics of Ideal Fermi Systems" (PDF). Universidad Autónoma de Madrid. Retrieved 2018-03-15. ^ "Degenerate Ideal Fermi Gases" (PDF). Archived from the original (PDF) on 2008-09-19. Retrieved 2014-04-13. ^ Nave, Rod. "Fermi Energies, Fermi Temperatures, and Fermi Velocities". HyperPhysics. Retrieved 2018-03-21. ^ Greiner, Walter; Neise, Ludwig; Stöcker, Horst (1995). Thermodynamics and Statistical Mechanics. Classical Theoretical Physics. Springer, New York, NY. pp. 341–386. doi:10.1007/978-1-4612-0827-3_14. ISBN 9780387942995.